This is a very fine original wood engraving by British artist John Nash. The image size is 6 x 4 1/2 inches, published c. 1930 in a very small edition of 20, pencil signed and titled in the lower margin. Primarily a self taught artist, John Nash was a renowned painter and printmaker and founding member of several prestigious artist groups, including the London Group in 1914, the Society of Wood Engravers in 1920 and the Colchester Art Society in 1946. He served on the front lines during WWI before being appointed an official war artist in 1918, and later continued his service as war artist during WWII. 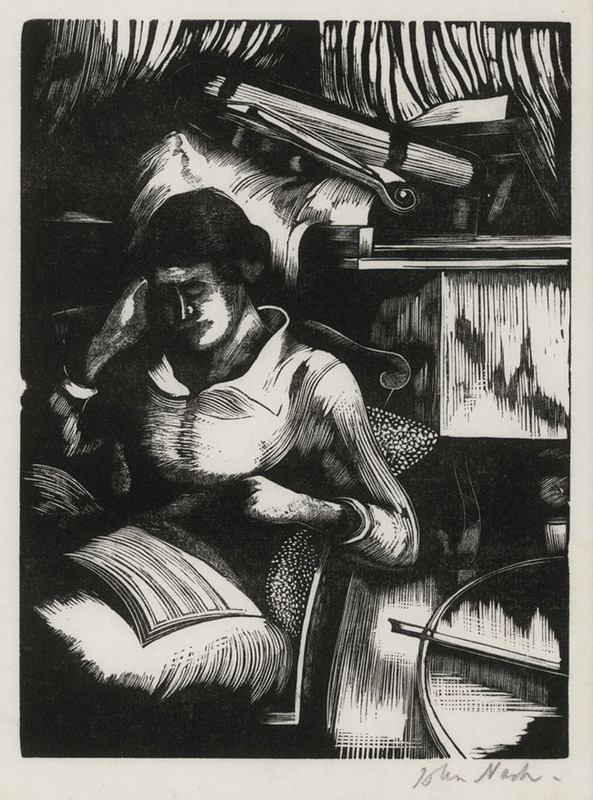 Many of his images portray events during the wars, but he also created many landscapes and quiet, peaceful images of domestic life, such as this intimate scene of a woman reading, surrounded by books and a violin.